Snuggled at the base of the ski slopes in the heart of Vail. Rams-Horn Lodge vacation condominiums have a cozy and unique mountain feel. 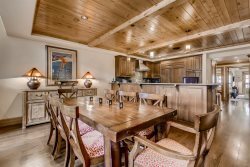 Gorgeous mountain views and a short walk to the ski lifts, shops, local restaurants and The Ford Amphitheatre. A family friendly atmosphere.